I am trying to get back into my reading this year, as I have a huge amount of books sat unread on my shelves. One way I have found brilliant to ease myself back in is to read the autobiographies of some of my favourite women's football stars. Last year I managed to read Under the Lights along with Alex Morgan and Abby Wambach's books but they took forever for me to complete, I am sure these will be reread very soon though as I would love to review them on here. There is also a new book coming out soon called The National Team : The Inside Story Of The Women Who Changed Soccer, so before I get on with that one I really need to get caught up on the rest of the books I own. To kick off 2019 in reading I decided to tackle Carli Lloyds book When Nobody Was Watching and I am so glad I did. For those of you who don't know Carli Lloyd is one of the top players in the Women's football world, with her performance in the 2015 World Cup just cementing her position as one of the greatest players, I mean how many players do you know score a hattrick in a World Cup final with one of those goals coming from half way, she is just spectacular. 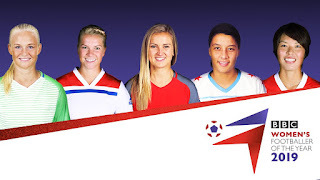 Carli is currently playing for the NWSL side Sky Blue FC along with the USWNT but has previously played at Houston Dash and my favourite English team Manchester City on loan, in fact I am still devastated that I never made it to a game whilst she played over here. This book is a couple of years old now but is still full of a great timeline of Carli's forever growing time as a player. You follow her story through various Olympics, World Cups and Algarve cups and follow the highs and lows of her career up to the date of the end of the book which is just after winning the 2015 World Cup. 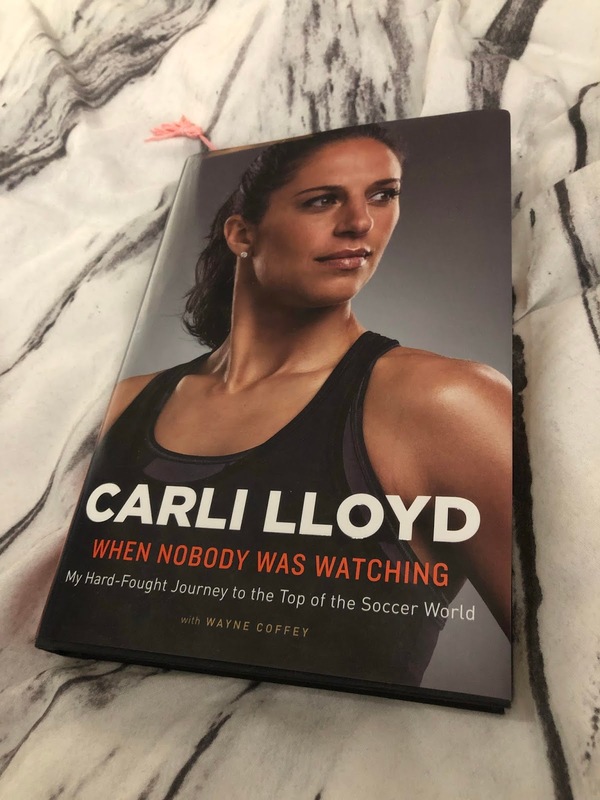 Not only does the book focus on Carli's rise to the top of the game but it also focuses on her family and how the effects of her decisions ultimately lead to a family rift where she ended up not seeing family for years. In the book Carli says she opted not to use a family member to act as an agent to help protect the family from any future fall outs however, this didn't go to plan and ultimately led to a family fall out and eventually Carli ended up being kicked out. Now I wouldn't have known anything in regards to this if it wasn't for the book and I would never have known how much Carli's parents were actually involved with her playing. I love how she goes on to say how family don't come to games as she doesn't really want the distraction of getting into sorting tickets and making sure they are settled, she just wants to get on and play the game. One of the main people in the whole book is James Galanis, a coach who Carli ends up teaming up with to improve on aspects of her game. Carli is super dedicated to the game, she gives it her all no matter what and she couldn't speak any higher of James. He helps her improve, makes sure she is reassured during competitions and doesn't let her beat herself up, he just motivates her to keep on pushing. Carli says in the acknowledgement the James and his family become a second family to her and you can honestly see why, with all the time they spend training together it is obvious they are going to share a special bond. Carli also doesn't hold back when it comes to her old team mates, how she feels like an outcast on her first call up to the National team, although she never names specific players you really get the feel the veterans on the team don't like newcomers and will do anything but make them feel welcome. She also talks about the time Hope Solo speaks out about being dropped for a veteran keeper in a game they lost, I didn't realise that as she stuck up for Hope tension grew with in the camp and she was actually told to watch her back. She refers to how her and Abby Wambach were never close due to the whole tension when she was first called up but eventually that tension disappeared and you could tell that when Abby was getting closer to retiring as they linked up well on the field together. I can't imagine how Carli would feel when players went out of their way not to make a pass to her, especially when she was more than capable of getting the team in a threatening position and scoring a goal, I know I would have gone mad not only are you effecting team play by doing that but you are making someone who can provide so much feel like they aren't needed on that pitch, if you do that to the wrong player they could really take it to heart and could put them off playing all together. She also goes through her National team coaches, the ones who would criticise her play and go out of their way to put her down, the ones who would let her play in her own style and those who would say one thing to Carli and later on say something totally different to the media. Carli says in the book coaches would say she was difficult, but honestly from the points she makes I can see why she would be, if they went out of their way to make me feel like I was no good I would keep pushing to prove them wrong too. If they told me I trained too much I would prove to them it was the perfect amount and show just how dedicated to the cause I was. It is nice to see how as the years went on and Carli found what worked best for her certain coaches would listen to her and let her adjust training in the gym to her specific workouts. If weights don't work for some players why make them all do it, each player knows what is best for their body at the end of the day and what is best to get their best performance out of them. After reading this I really do realise why Carli plays the way she does and just why she is as good as she is. I mean she reference after the World Cup during celebrations she had a burger and chips which she usually allows herself once a year, now that is dedication in itself and proof that a legendary player doesn't just work during the season and camps but they are constantly on top of their training regime 365 days a year. I hope one day I can find that dedication Carli has and apply it to my own aspects of my life as this book has really inspired me. I also hope I can see Carli play one day so fingers crossed the USWNT come to England for a game sometime soon. At 36 years old I am worried that Carli is coming to the end of her career but honestly I feel she still has so much to give to the footballing world. I can't see her slowing down too much and I think in the future with her leadership she will go on to great things in terms of management if she decides to take that route. I just hope when the time does come and she retires there is another book brought out filling in the blanks between the 2015 World Cup and that day as it will be great to fill in the career blanks. Plus this book is absolutely brilliant, if you like the Women's game and want a better insight into one of it's biggest names make sure you give it a read. 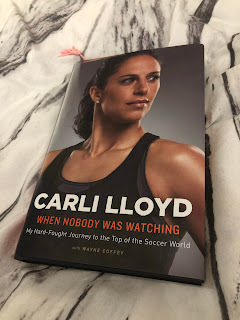 Carli is definitely a Women's soccer legend already in my eyes and for so long I have wondered why.... now thanks to this book I totally understand. Up next Solo : A Memoir of Hope by the one and only Hope Solo.